This year I received a studio residency grant from the Women's Studio Workshop. It is an opportunity for me to use the studio space to create a new body of work. I arrived at WSW prepared to begin by pulling an edition of handmade abaca paper. I had made paper before--in Japan (2003) and in graduate school (2004), but both times professional papermakers facilitated the process. In 2008, I came to WSW for the first time on an Artist's Book Residency to edition my artist book, Treasure. I had decided to make the paper for this book--it was the first time I had made paper in such a serious way. I had two excellent papermakers assist me with the process: Mary Tasillo and Michelle Wilson. 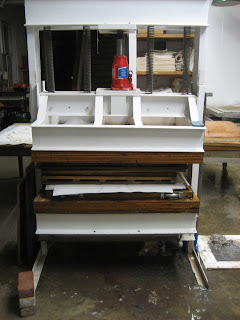 They spent the week with me, beating the pulp, pulling sheets of paper, and coordinating the drying process. The book I made had ten folios and was an edition of 36. Together we pulled hundreds of sheets of paper for the project. This time, I was facing the process of making paper on my own. Thankfully Chris Petrone, one of the permanent staff members of WSW, was able to help me figure out the quantity and the time for beating the pulp. She also talked me through the aspects of pulling, couching and drying the paper. Chris was graciously available to answer my questions late into the evening. Draining the pulp from the beater. Making paper is like many of the other technical processes I am attracted to. On one hand, it's so simple: beat pulp, mix with water, use screen to pull thin layer of pulp from vat, dry on board: paper! Yet the craft of pulling a sheet of paper--and I mean a good sheet--is really difficult. And the only way to learn it is by doing it, a lot. When I started, I was simply thrilled with myself for pulling a sheet of paper! 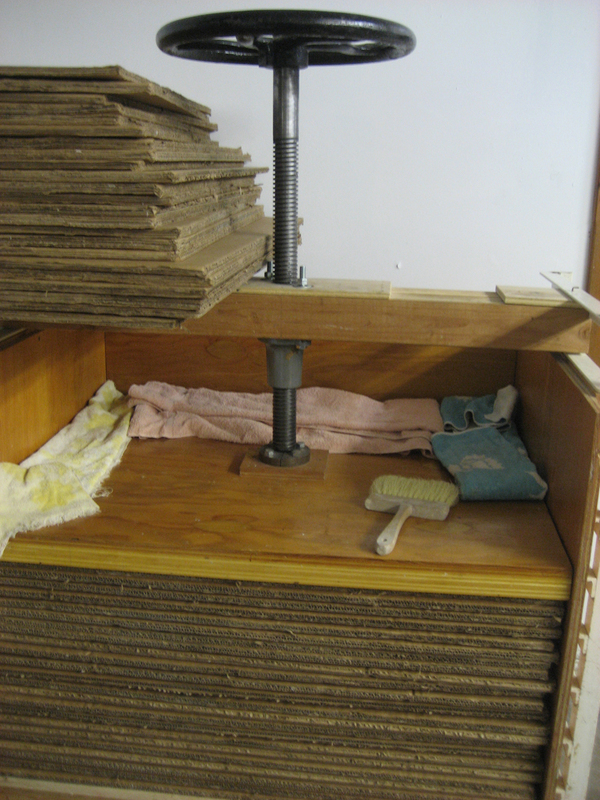 However, the more sheets that I pulled, the more I began to notice when the pulp was uneven, or that I had jostled the mould and deckle, or that the pull was too thick, or too thin. As I became more sophisticated in my knowledge of the process, I began to have a clear understanding of how clunky I was at this craft. Occasionally, I could get it just right. To couch: a verb, not a noun. 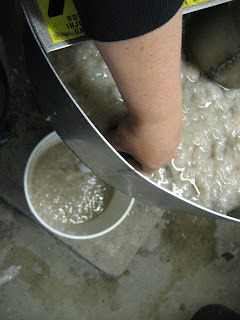 After the paper is pulled, the water has to be squeezed out of it. Then the paper dries between blotters and boards over night. This is the beginning of making a new body of work. I am surprised to find myself so intimidated by this stack of blank handmade sheets.